In the Week 17 edition of fantasy baseball 3×3, we’re snagging Joaquin Benoit, sticking with J.J. Hardy, and waiting for reality to set in for Casey McGehee. Any questions, thoughts, reports of ridiculous unwritten rules violations? Hit me in the comments or on Twitter. Seriously, Colby Lewis is the worst. 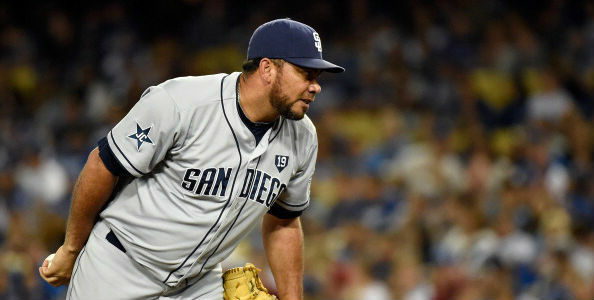 Now that Huston Street has been shipped off to Los Angeles, Joaquin Benoit slots as the closer for the San Diego Padres. He won’t get a ton of opportunities to close things down for one of the worst teams in the National League, but Benoit is one of the most consistently excellent relievers in baseball and when the Padres do get a lead, it’s usually within the confines of a save situation. Since re-emerging with the Rays in 2010, he hasn’t posted an xFIP worse than 3.29 or a strikeout rate below 26.1% in any single season. He closed for the Tigers most of last year, locking down 24 out of 26 save chances. He had some issues with the home run ball toward the end of last season (he’s the guy staring sadly into the distance in this video), but Petco Park tends to iron those things out. So far this season, he’s converted his only save chance alongside 16 holds. I don’t expect Benoit to underperform as a closer, but be aware that there’s a chance his time in this role for the Padres could be relatively short. Not because of any challenger in the San Diego bullpen, but because I expect the Padres to be willing to listen to trade offers for anybody on the roster. The good news is that the team most rumored to be interested in Benoit, the Detroit Tigers, would probably only trade for Benoit if they plan to boot Joe Nathan out of the ninth inning. It’s really just speculation on my part, but the Tigers had the choice between the two of them this offseason and chose to go with Nathan; I don’t expect that they’ll re-acquire Benoit (and the $8 million he’s due next season) unless it’s really an emergency. In any case, Benoit projects to close games, and to do so with aplomb, for the rest of the season. He needs to be owned in every league. We all drooled over him earlier in the season and we all cried over his injury shortly thereafter; James Paxton is healthy and poised to return to the Seattle Mariners rotation, bringing this wonderful goodness back into our lives. He only threw 12 innings with the Mariners before his injury, but he was dynamite during that span, allowing only three runs and just eight baserunners. His fastball sits comfortably at 94 miles-per-hour; he backs it up with a curve that was damn near untouchable in his short MLB stint. Paxton threw the hammer 26 times; he generated whiffs on two-thirds of swings against it and allowed only one ball to be put in play. It was a routine ground ball out. Paxton is in the midst of a rehab assignment now. He’s been pain free throughout and should be back up in the big leagues in a week or so. Snag him now while you can. Chris Dickerson announced his presence with authority on Saturday night, slugging two homers against Max Scherzer and seizing his opportunity in a wide open Cleveland Indians outfield. Dickerson was initially acquired to replace the injured Michael Bourn, but he could easily hit his way into something very close to an everyday job. He struggles against lefties, but he’s hit well against righties in his career, posting .782 OPS alongside a nice combination of speed and pop. That, combined with Dickerson’s excellent defensive reputation, makes the future look awfully murky for David Murphy, who’s currently occupying the nominal role of righty-mashing outfielder in the Cleveland lineup. I added “nominal” in there because Murphy’s been just about as bad as the left-handed half of a platoon can possibly be. He’s slashed .237/.305/.362 against righties so far, well below his career .275/.342/.458 line, but strikingly similar to last season’s .219/.286/.399 effort. His meltdown will only smooth the path for Dickerson to establish himself as a regular in Cleveland. Dickerson’s projections are a bit hard to wrangle (nobody expected him to work his way into significant playing time), but based on his short sample expectations and the volume of plate appearances he could earn with everyday work, he’s capable of chipping in a handful each of homers and steals alongside a palatable batting average and OBP. Dickerson’s ceiling isn’t quite high enough to make him a consideration in shallow mixed leagues, but I’d give him a look in AL-only for sure. The pre-ASB time period isn’t always enough of a sample to draw accurate conclusions about a player, but it’s not an insignificant one either. Casey McGehee had a great first half and performed at an exceptionally high level, and he deserves praise for that. But he also benefitted from more good fortune and any other cleanup hitter in baseball, even excepting the fact that he gets to hit behind one of the most feared offensive forces in baseball, Giancarlo Stanton. Only Albert Pujols and Ryan Howard have come up more often with men on base and only Lorenzo Cain can outpace McGehee’s .411 BABIP in those situations. It’s not wholly unusual for players to have more success when defenders are pulled toward checking runners and covering bases, but this year’s mark is way out of character for McGehee. 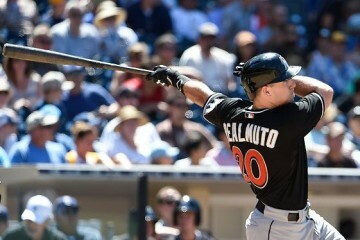 In 2012, his BABIP with men on was .301. In 2011, it was .237. In 2010, it was .313. Though his BABIP, which currently sits at .369 overall, is doomed to regress, McGehee’s improved plate discipline will help him maintain a strong OBP. His power is bound to bounce back a bit (his homer on Sunday doubled his season total), but the RBIs are going to dry up, taking much of his fantasy value with them. He’s currently tied for 25th in baseball in that category; it wouldn’t surprise me at all if he finished outside the top 50. We discussed last week how Jesse Hahn is breaking the mold of the typical flash in the Petco pan by actually being, you know, a good pitcher. The flip side of that coin is adorned with the smiling face of Odrisamer Despaigne. Riding a sub-.200 BABIP and near 90% strand rate to instant fantasy relevance, Despaigne is the picture of how San Diego can turn the stat lines of mediocre pitchers from frumpy to fabulous. Despaigne’s very minor league track record actually shows some strikeout upside, but to this point in his big league career, he’s barely managed one punchout in every other inning. Even when he flirted with a no-hitter on Sunday, he managed only five strikeouts against three walks. Only his sinker has generated above average whiffs against MLB hitters, and at just over 13% whiffs per swing, it’s not good enough to generate any kind of strikeout volume. Despaigne is 27 years old and experienced in the Cuban League; his minor league strikeout rates were likely the result of a craftiness and guile that just doesn’t work against better hitters. His below average chase rate proves that he’s not fooling anybody. 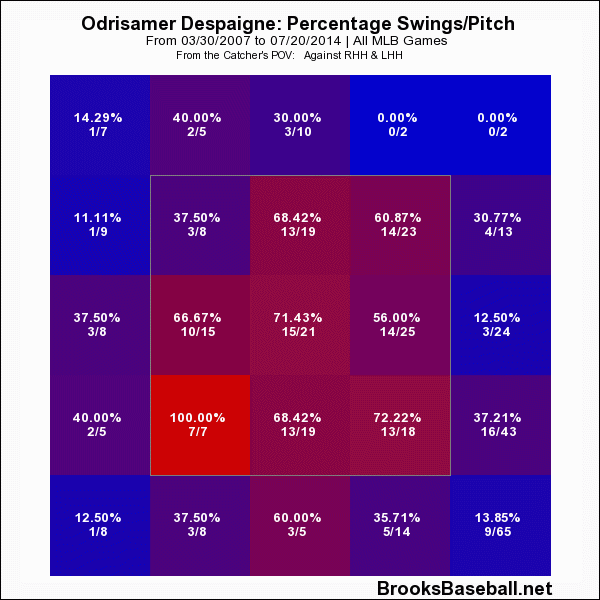 Smart hitters are attacking Despaigne when he does come into the strike zone. The fact that all five of his starts so far have come in pitcher’s parks (San Diego, Los Angeles, and San Francisco) has helped to limit the damage, but as the season goes on, his ERA will likely draw closer to his 4.39 xFIP. Good news, Edinson Volquez has finally slayed his command demons and cut his walk rate to almost league average! Over the last 30 days, he’s ridden that newfound control to the third-best ERA in baseball. He’s surrendered no more than one run in five of his last six outings. Bad news, his improved control has seemingly come at the expense of the life that used to make his stuff overpowering. His walk rate is a career low at 8.0%, but his strikeout rate, swinging strike rate, and contact rate are all career lows as well. Oh, and that start when he didn’t allow one run or fewer? 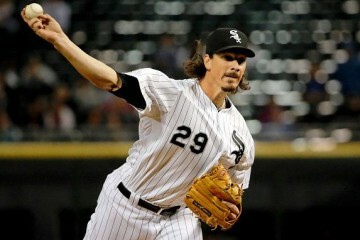 He couldn’t make it out of the third inning after surrendering nine baserunners and eight runs to Cincinnati. Still, that’s just one start. It’s possible that the change in profile means that Volquez has finally figured out how to effectively tap into his immense talent. Let’s not forget, this dude was traded pretty much straight-up for Josh Hamilton back in 2007. If he’s figured out a way to rein things in, he could be a major fantasy asset. Granted, the stats I picked above don’t account for his improved control, but almost every single one of his pitches has gotten significantly worse this season. It’s not surprising to see the declines in whiff rate and velocity, but without generating more ground balls, I’m not really sure what Volquez could possibly be improving. Yes, the command has gotten better, but his walk rate is still below league average. It’s encouraging to see a veteran player willing to change his approach in order to earn a place in the big leagues, but Volquez hasn’t turned himself into a better pitcher, he’s just caught a wave of good luck. Outside of the deepest NL-only formats, he shouldn’t be a consideration for fantasy players. Much like the argument I made two weeks ago in favor of his teammate, Chris Davis, this is a bet on a player returning to the form he’s consistently maintained throughout his career. J.J. Hardy is on pace to log just over 600 plate appearances this season; through 359 trips to the plate, he’s hit just four home runs. On the four occasions on which he’s eclipsed the 600 plate appearance mark in the past, he’s never hit fewer than 22 homers, and that’s not counting the year when he hit a career high 30 bombs in only 537 plate appearances. It’s quite an oddity, one that’s just as difficult to explain as it would’ve been to project. Other than the frightening drop in power production, there’s been little change in Hardy’s game this season. His plate discipline has been slightly worse than normal, but his batted ball rates are nearly identical to his career averages. 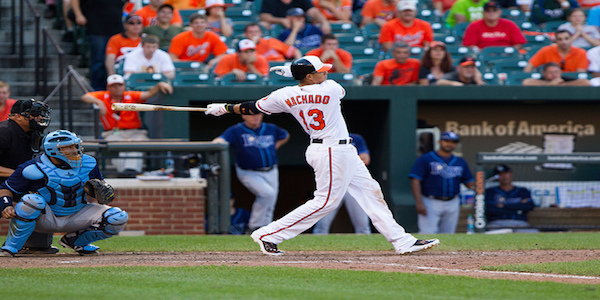 His 280-foot average fly ball distance matches last year’s figure almost exactly. It’d be silly to project Hardy into a monster second half in which he catches up to his career norm, but it’d be just as silly to expect his underperformance to continue. The right answer, as it often does, lies somewhere in the middle. ZiPS and Steamer both project Hardy to crank seven dingers the rest of the way. Among shortstops, only Troy Tulowitzki, Hanley Ramirez, and Ian Desmond are projected to find the seats more often. In his last nine starts, Phil Hughes has 5.16 ERA. In four of his last nine starts, Phil Hughes has pitched in Colorado, Texas, Boston, and Toronto. He’s been burned by a .382 BABIP and a couple of bouts of the homeritis that plagued him earlier in his career, though two of the six homers he allowed during that span qualified as “Just Enough”, per ESPN’s Home Run Tracker. In his last nine starts, Phil Hughes has fanned 53 and walked only five in 59.1 innings. He’s maintained a 40.8% chase rate that would rank as the best in baseball and jumped his ground ball rate six percentage points above his career average. His 2.82 FIP over those nine outings is better than American League aces Max Scherzer and Corey Kluber. Perspective is everything on Hughes. He burned more than a few fantasy owners after largely failing to live up to the tidal wave of hype that propelled him up to the Yankees rotation. He’s evolved since then, but fantasy owners haven’t forgotten his checkered past and been quick to jettison the struggling Twin. His ownership has sunk near 50% in Yahoo! leagues and even lower in ESPN formats. Use the bias against him to your advantage. Hughes’ luck will turn soon and he’ll remind us all that in the present, he’s a very good pitcher who can absolutely contribute in 12-team fantasy leagues. Rajai Davis was always expected to be a part-time player. While J.D. Martinez’ ascendance into the everyday lineup has taken a bit of a bite out of Davis’ playing time, another recent development in the Tigers’ roster has provided a counterbalance that’ll likely keep Davis in the lineup. Andy Dirks, who was initially expected to platoon with Davis in left field, has suffered a setback from the back injury that’s kept him out for all of this season. The Tigers are trying to string out Dirks’ rehab assignment, but if he’s not healthy enough to join the big league club in the next two weeks, they’ll have a difficult roster decision to make and may end up keeping him down in the minors. The fact that manager Brad Ausmus has slotted Torii Hunter at DH in six of his last 13 games also works in Davis’ favor. That decision was largely driven by Victor Martinez’ injury, but it also signals Ausmus’ realization that Hunter is a minus defender in right field. By UZR, Hunter is more than that. He’s the worst defensive right fielder in the league by miles; he’s responsible for almost triple the negative impact of the second-worst right fielder. Davis isn’t a defensive ace by any stretch, but his below average output in left, plus Martinez’ average-ish defense in right represents a significant upgrade. 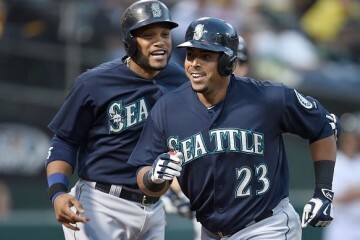 While all of the lineup machinations are sorted out, Davis will keep playing and keep stealing bases. He’s continued to make good contact and keep the ball largely on the ground, leading to a very solid .292 batting average. While he’s showed more pop this year than he has in the past, Davis’ bread is still buttered on the basepaths, where he’s already snagged 24 bags. He hasn’t been quite as aggressive in the past week or so, but that’s to be expected against outstanding throwers like Salvador Perez and Yan Gomes. He’ll pick up the pace as the season goes on. Hey Gerard! I was wondering what you think about Eduardo Escobar, and how well him and the returning Danny Santana will affect each other’s production? Also, can you rank these fellas for me? Fowler, Calhoun, Span, Yelich, Chris Dickerson, and Rajai Davis. Thanks, man! I’m not really high on Escobar, I’d much rather have Santana. I think he will separate himself as the season goes along and earn the bulk of the playing time.